"This one-cent coin honors the preservation of the Union, which was Abraham Lincoln's ultimate achievement. Because of his presidency, despite bitter regional enmity and a horrific civil war, we remained the United States of America." Thus declared United States Mint Director Ed Moy at the official launch of the 2010 Lincoln cent. The same legislation (Title III of Public Law 109-145, the Presidential $1 Coin Act of 2005) that authorized the four different reverse designs for the 2009 Lincoln Cent also provided for a new reverse design in 2010--one that is "emblematic of of President Lincoln's preservation of the United States of America as a single and united country." The day before Abraham Lincoln's 201st birthday, the US Mint launched the 2010 Lincoln cent, which the Mint calls the "Preservation of the Union" cent in Springfield, Illinois. About 400 people attended the ceremony at the Abraham Lincoln Presidential Library and Museum. Though the official launch was on February 11, Michael Zielinski of Mint News Blog wrote at the end of January that the 2010 Lincoln cents were already appearing in Puerto Rico. The 2010 penny design will be on all pennies for the forseeable future--likely until Lincoln's 250th birthday or until someone deems the penny too expensive to produce. (The metalic value of the coin is 0.61 cents, but it currently costs the Mint 1.61 cents to make them, meaning that the current cost of overhead is equal to the value of the penny itself!) It is primarily made of zinc, with just 2.5 percent copper. The obverse (heads) side of the penny continues to bear the familiar Victor David Brenner likeness of President Lincoln that has been in place since 1909, the reverse features a new design. 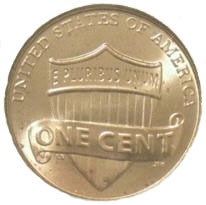 The Union shield is prominent, with a scroll draped across it bearing the inscription, "ONE CENT." The Mint says, "the 13 vertical stripes of the shield represent the states joined in one compact union to support the federal government, represented by the horizontal bar above." On that bar is the famous inscription, "E PLURIBUS UNUM" (out of many, one). Along the upper rim is the inscription "UNITED STATES OF AMERICA." 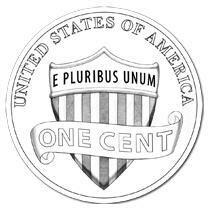 E Pluribus Unum is from the 1776 seal of the United States, when the Union was first created. It's unfortunate the Mint didn't specifically call out the reason for this design with this inscription instead: "Preservation of the Union." 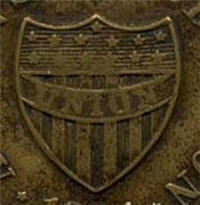 Likewise, the Union shield commonly used on Civil War dog tags would have been a more relevant shield design. Scroll to see why the "sword and pen" would have been the better reverse design. The 1959 Lincoln cent reverse design started a trend of honoring Abraham Lincoln on the back of the coin as well as the front. The sesquicentennial of Lincoln's birthday in 1959, introduced the Lincoln Memorial on the coin. 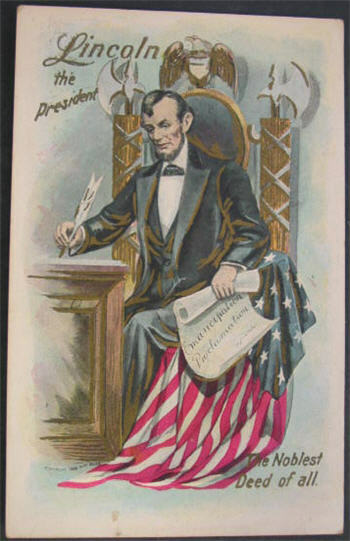 In 2009, four different designs depicted scenes from Lincoln's life. But the 13 stripes and E Pluribus Unum inscription is more of a nod to the Founding Fathers than to Abraham Lincoln. 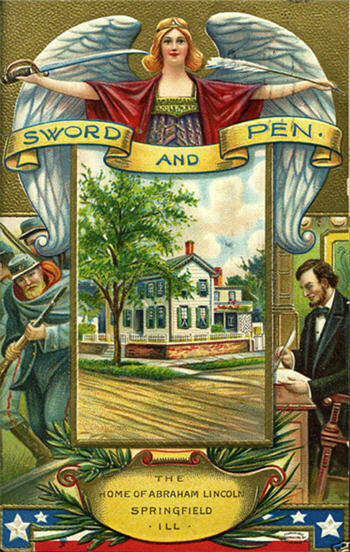 The sword and pen design that was one of the candidates for the 2010 penny is a much better depiction of the combination required to preserve the Union. "I never in my life felt more certain that I was doing right, than I do in signing this paper," said Lincoln about the Emancipation Proclamation. There were initially 18 candidate designs candidates before one was removed from consideration. The eighteenth design was reminiscent of the 1909 wheat design. It showed 13 wheat stalks bound together with the inscription "One Nation." 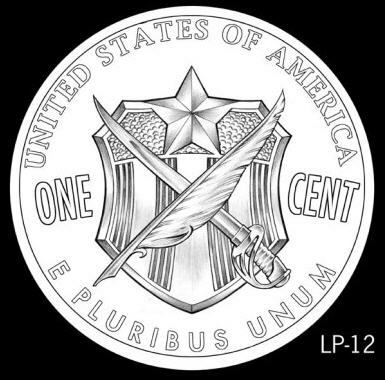 But the US Mint removed this design candidate because it was "inappropriately similar to a 1920's era German pfennig." Copyright © 2005-2015 Alta Omnimedia. All Rights Reserved.